The second round of season 2 finished up recently, and we now have the results! 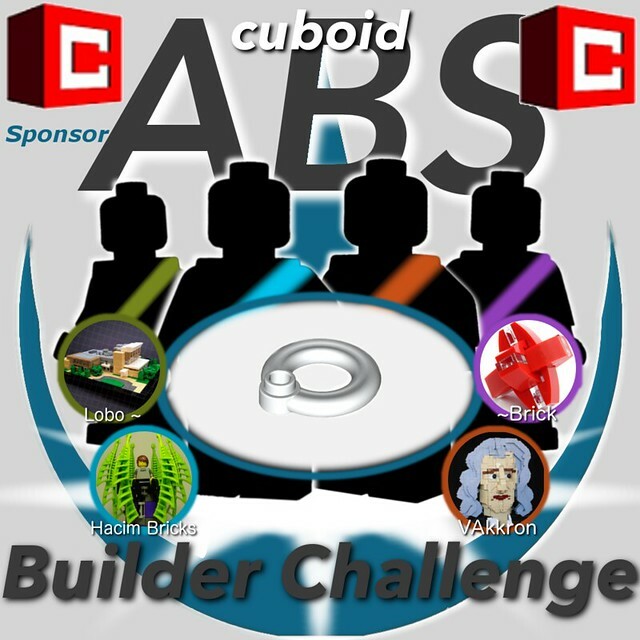 Round 2.2 was sponsored by Cuboid, so remember their bricklink store the next time you need some parts. This round's seed part was the white life preserver and the competitors were: Brick, Caleb, Micah, and Paul. These four builders came up with 24 builds incorporating the life preserver. Our five judges have given their scores and the winner was decided to be Paul Wolfe! This round was the closest yet, with two competitors receiving the same amount of studs, and only the points breakdown giving Paul his victory. As always, you can keep reading to see the full scoring details, and some interview questions with the competitors themselves! That was incredibly close, though we've almost come to expect that with ABS Builder Challenge. It's a fierce competition for sure! Now onto the interview questions! Paul - You've heard it from previous competitors, but I really enjoyed seeing how my opponents utilized the part and what they had built. 2 weeks is such a compact space of time to get 5-7 builds done, and it's really neat to log on every day to see something new and creative. Micah - My favorite aspect of the competition was probably the sociability it helped me to have with other members of my corner house, and other competitors. Brick the third competitor and I even shared WIPs with each other and gave each other suggestions on ways to use the part. Brick - I enjoyed how the competition gave me a reason to build. It sounds silly, but I often forget how much I enjoy building. The challenge forced me to build and helped remind me the tremendous amount of fun I have while doing it; moreover, having to incorporate a seed part, with points partially based on originality, encouraged me to diversify what I made. This allowed me to try some new themes and explore styles I otherwise wouldn't have. 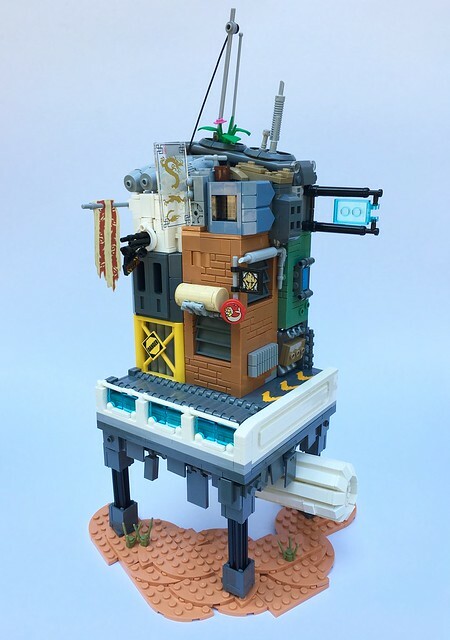 Caleb - Ive always wondered how the rules and constraints of this competition would fit my building style. I dont build fast and I dont have an enormous collection, so I like to take time to plan MOCs to be the best they can be with the pieces on hand. 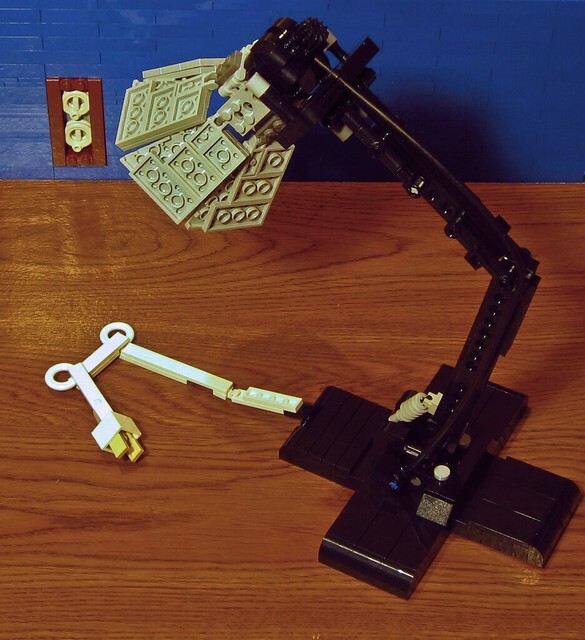 I was surprised by how easily I came up with ideas and figured out how to build them. I knew after a few minutes of tinkering if an idea would work or not, and that really sped up my building process, which was a great learning experience. Paul - My first reaction was pretty positive, the part's in white, which is very usable, and it has a lot of connection points. However as I started to play around with it, I discovered how strange its dimensions really are. You can't attach many of them next to each other using studs, even with jumper plates. The hole is the middle isn't really completely filled by anything, and circular as the piece is, the stud connection forms a weird jut-out. I don't know how many times family members suggested something only for me to say something along the lines of, "That's a neat idea, but the stud jut-out makes that difficult to do effectively." In the later stages of the competition though, I came much more to terms with these limitations and had a bunch of ideas I didn't even get to. So in the end, I feel pretty happy with the part. Micah - When I first saw the part I thought it seemed like a pretty good piece to work with for this type of competition, but then I ended up really struggling with good ideas for how to use it. Luckily I had lots of people willing to give me suggestions though, because I really only came up with two of my usages myself. Pretty much everything else was suggested to me by others. Brick - To be quite frank, I thought of toilet seats when I first saw the part. Once I had gotten over that, I began considering all the points of connection the piece had. I was a bit disappointed with the color, believing white to be quite limiting, but after some time spent thinking I had conjured multiple ideas for the part. The more effort I put into brainstorming potential uses for the element the more I realized it's potential. Caleb - I was most surprised at the pieces color. A lot of the pieces work somewhere else in the rainbow, which limits the opportunities of their use. This one has a pretty versatile color and shape, which, for me, made it applicable to dozens of models. Now, I think the most limiting factor is its unwieldy size, since its just too big to fit inside a lot of other round pieces. 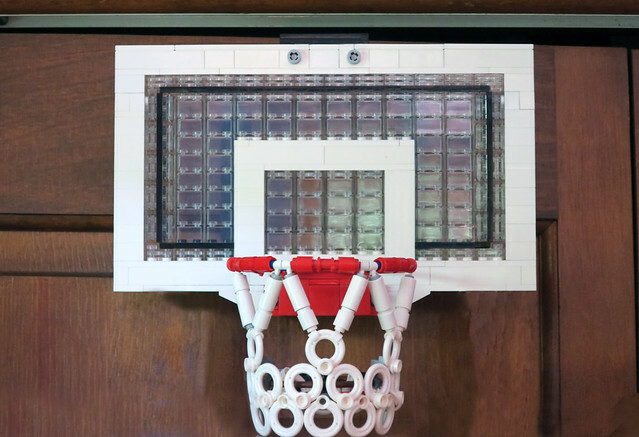 Paul - I think my personal favorite build was my first, and that is my "Bedroom Basketball Hoop" I still have one of these in my room from when I was younger. My building space is in my room also, so when I saw the part and was looking for inspiration, I spied the net in the corner, and decided to try that. I worked very hard at the presentation of my builds throughout the contest, and with this one specifically, I knew I wanted to have it at the top of a closet door. So to do this, I didn't cut out the background of the photo. Instead, I actually had my sister and a friend hold the build, which was on a tray, up to the top of the door as I had wanted. Big thanks to them for helping out there! I think the effect came out well. Micah - My favorite build I did was the popcorn. This was one of the uses for the part I actually came up with myself, so that might be part of why I'm a little more proud of the build. I think I came up with the idea by just playing around with the part in my hand, and from there it was a pretty strait forward build. 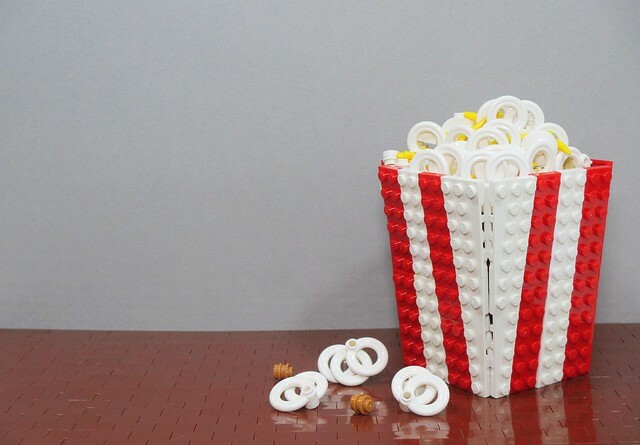 I did spend a bit of time trying to figure out how to do the popcorn box, initially trying to use bricks rather than plates, but I think the studs of the plates give a better contrasting texture to the popcorn than bricks would have. Brick - My favorite build this round was my cyberpunk vignette, titled, "Peaked Interest." It was my first time building in the theme and was incredibly fun. Unfortunately, the build was very time consuming, taking about 6 days to complete. I also failed to meaningfully incorporate the seed part, but in the end I'm very happy with the finished product. Once again, a big thanks to the competitors for putting on such a great show! Be sure to visit our sponsor's BrickLink store - cuboid for when you make your next BrickLink purchase. If you're interested in competing in a future round, apply in our applications thread on Flickr. Now that ABS round 2.2 is over, it's time for round 2.3! Stay tuned!